Join us for a 2-hour, online VETgirl CE webinar, where Rachel Bassett, CVT, VTS (Anesthesia) reviews the approach to general anesthesia in a case-based lecture. Tune in as she reviews general anesthesia, including intra-operative pain management options. Next, we'll bring it all together and apply this to a variety of anesthetic cases from the straight-forward, elective procedures to the complex, critical cases presenting with pre-existing conditions that need to be managed. Is this race approved for lvt’s or doctors? How do I register for this course? Thank you! Also, is this considered and interactive course? Hi! If you watch the webinar LIVE at the time of release, it’s totally interactive and counts the same as sitting in a veterinary conference. 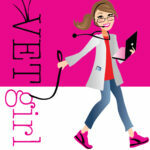 If you’re a VETgirl ELITE member and watch this as a recording (or on demand, it only counts as non-interacxtive and you must pass the quiz by 80% to get a CE certificate). You should have been emailed a CE certificate via a LINK to the interactive CE 1 hour after you watched the webinar live. But you want to watch this webinar and receive CE credit?